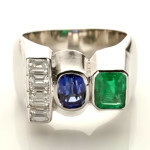 This is a trilogy ring with a most unique design which is comprised of very fine quality Four Em Cut Diamonds and Oval cut fine Blue Sapphire along-with an Emerald cut Emerald all set in Platinum for KAMLA YOGH, Success, Prosperity, Luxuries, Professional independence, Financial Independence, Properties, Assets, Economical success, Rising, Performance, Achievements, Rewards, Determination, Creativities, Vision and Drive. Wearing this ring will awaken a power inside the native which will be enormous and quite considerable. This is most appropriate and suitable for those whose rising sign ascendant is Capricorn, Aquarius, Taurus, Libra & Virgo. However it is very important to consult an experienced Astrologer before wearing this trilogy ring since this ring can also cause adverse effects if not suited to the birth kundali or horoscope of the native.